The Russian delegation was headed by Dmitry Medvedev; the European Union was represented by President of the European Council Herman Van Rompuy and President of the European Commission Jose Manuel Barroso. The completion of talks between Russia and the European Union on Russia’s entering the World Trade Organisation was officially announced at the summit. Earlier in the day, Russian Economic Development Minister Elvira Nabiullina and EU Trade Commissioner Karel De Gucht signed a memorandum of understanding regarding the terms of Russia’s joining the WTO. 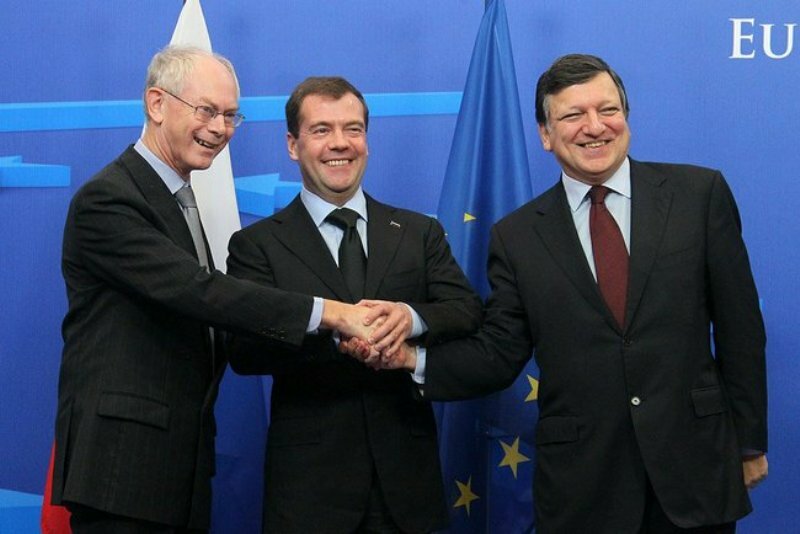 Dmitry Medvedev, Herman Von Rompuy and Jose Manuel Barroso discussed the global economic situation and ways to overcome the effects of the global economic crisis. In particular, the discussion addressed the implementation of decisions made at the G20 summit on reforming the global financial system. Furthermore, priority attention was given to easing the visa regime for short trips by Russian citizens to the European Union, milestones were set for the subsequent integrated work in this area, including taking into account the draft agreement on abolishing visa requirements for Russian and EU citizens, which was handed to the EU at the summit in Rostov-on-Don. The summit also addressed Russia and the EU’s Partnership for Modernisation initiative and discussed a working plan of action and projects in priority areas. The sides exchanged views on global energy security issues and energy cooperation between Russia and the EU. They touched on issues of improving the legal framework for energy cooperation. The Russia-EU summit agenda also included topics of Euro-Atlantic security, including in the context of results of Russia-NATO Council meeting in Lisbon and decisions made at the OSCE summit in Astana. Following the summit meeting, Dmitry Medvedev, President of the European Council Herman Van Rompuy and President of the European Commission Jose Manuel Barroso held a joint press conference.